Between 2005 and 2007 political discussion about costs of maintaining the MiGs. Eventually they were grounded for a some time and even proposed for sale! March 2010: a large plans of purchase fighter aircraft, surface-to-air missile systems, helicopters, air-defense radars and armaments for Bangladesh Air Force, unveiled by Prime Minister Sheikh Hasina during annual exercises WINTEX-2010 at the base at Kurmitola inside Dhaka Cantonment, watching flying display and intercepting operations. 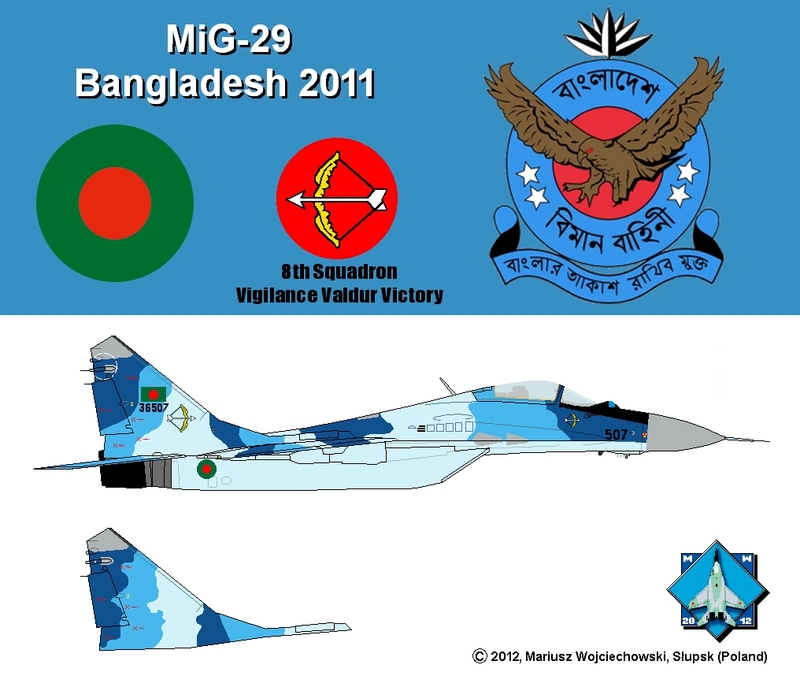 So, Bangladesh want to order a new MiGs in SMT or M standard. In 2010 MiGs returned to service, overhauled in Ukraine in Lviv State Air Repair Plant (LDARZ), equipped with some new devices, probably for radio communication. Is reported that is a former prototype of MiG-29SE #999 owned by MAPO MiG, displayed in 90's at several shows and fairs in distinctive Bangladeshi camouflage. 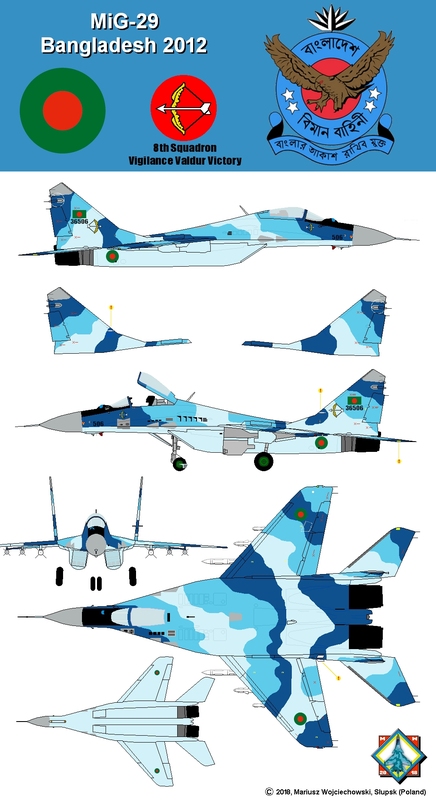 Bangladeshi MiG-29 in original 4-tones camouflage, 2000. All aircraft have similar camouflage. 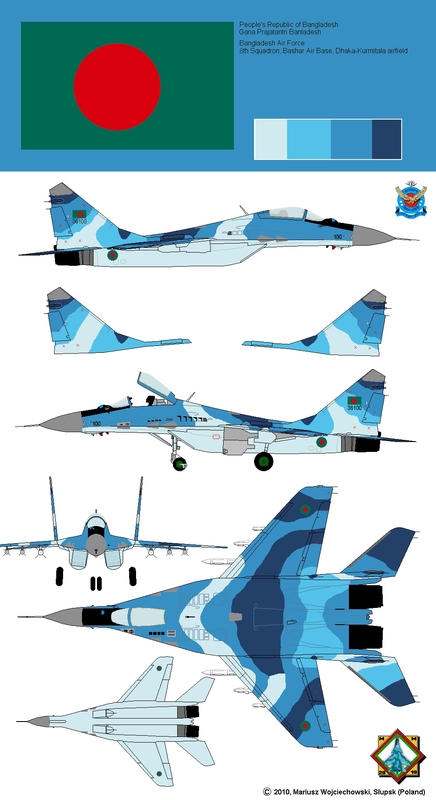 Bangladeshi MiG-29 in 3-tones camouflage, after overhaul, 2011. Each aircraft has different shapes of camouflage waves. Drawing (only one side) accuracy: 100%. Bangladeshi MiG-29 in 3-tones camouflage, after overhaul, with some new antennas, 2012. Each aircraft has different shapes of camouflage waves.